About 135 species of plants including shrubs, climbers, tress such as Diospyrous Melanoxylon, Tectona Grandis, Anogessus Latifolia etc showcases the rich diversity of the area. 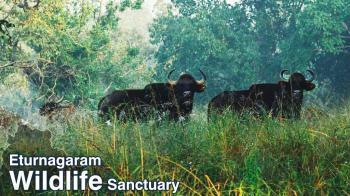 The sanctuary is the home of 30 species of mamals which include Tiger, Leopard, Sloth Bear, Mouse Deer, Pangolin, Flying Squirrel. Birds like Grey Hornbill, Open Billed Stock, Small Green Billed Malkhoa etc makes this place birds paradise. The wonderful reptilian fauna is represented with the presence of over the 10 species of reptiles like Marsh, Crocodile, Star Back Tortoise etc. The invertebrate fauna like Long Horned Beetle, Blue Bottle Buterfly, Scorpion, Tunel Spider, Katydid Grasshopper etc. Between September to March is the best season to visit the park. Temperature in summer ranges from 22°C to 41°C. Temperature in winter ranges from 15°C to 30°C. By Air - The nearest airport to the park is Hyderabad International Airport. By rail - Warangal Railway Station is the nearest railway station to the park. By Road - A number of RTC buses and private transport are available from Warangal.